About ten inches long with almost a two foot wingspan. Mostly pale facial disks with dark border. Dark brown upper parts with large white spots. Pale underparts with large, dark irregular streaks. Yellow eyes. 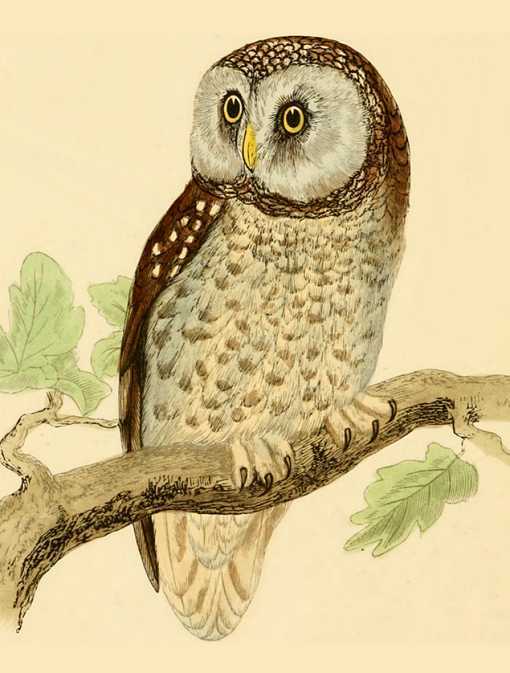 The Boreal Owl is most likely to be confused with the smaller Northern Saw-whet Owl but lacks brown in the face, has a pale bill, has a dark border to the face and darker brown upper parts. Boreal owls range circumpolar and inhabit coniferous and mixed hardwood forests in northern Europe, northern Asia, Alaska, and Canada. They are most common in spruce or pine woods, although it is regularly found nesting in aspen in Minnesota. The first report of its nesting in the lower 48 states came from Minnesota in 1978. Since then a breeding population has been found in northeast Minnesota and local populations reported in Idaho, Montana, Wyoming, Colorado and Washington. Night hunter of small mammals and lesser quantities of birds. 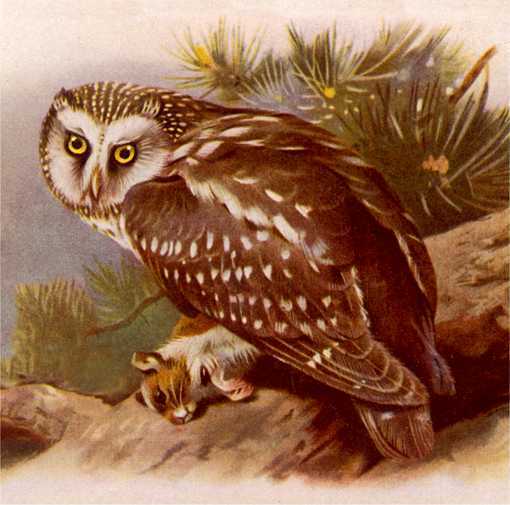 Population densities and migrations of the boreal owl can be tied to rodent populations. The boreal owl is a cavity nester which will also use nest boxes, particularly in Europe. The male sings near a cavity to attract a female. The female does most of incubation while the male feeds her. Females lay three to six eggs which hatch after about four weeks incubation and young leave the nest in about another four or five weeks. The Boreal Owl Nest Box has a 7″ by 7″ floor, 16″ inside floor to ceiling, a 2 1/2″ tall by 4 1/2″ wide entrance hole located 14″ above the floor and ventilation openings in the floor and under the roof. Assemble with corrosion resistant screws fit to pre-drilled countersunk pilot holes to reduce wood splitting. A hinged roof can be secured with shutter hooks for easy access at significant heights, or a fixed roof and Side Opening Doors may be a more convenient and safer alternative. Mount 10 feet or higher near woodland edges or clearings. Place a bed of wood chips on the floor, not saw dust which may retain moisture and mold growth. Mount 10 feet or higher near woodland edges or clearings. Place a bed of wood chips on the floor, not saw dust which may retain moisture and promote mold growth.